Government official in the employ of the Ottoman empire; born 1840. He received his early education at the Institution Camondo, and, after filling several subordinate positions, was appointed by Sultan Aziz, in 1869, a member of the council of state (Chouraī-Devlet), which contained two Jews in a membership of forty. On the accession of the present sultan, Abdul Ḥamid II., Ashkenazi became a member of the Ottoman parliament, as a delegate of the Jews. He then became "vice-prefect" of Constantinople, a position which he held for several years, making, however, many enemies by reason of his steadfast integrity. In 1896, in recognition of his services, the sultan again made him state councilor; and only lately (1899) he has been placed upon the retired list after thirty years of loyal and efficient service. 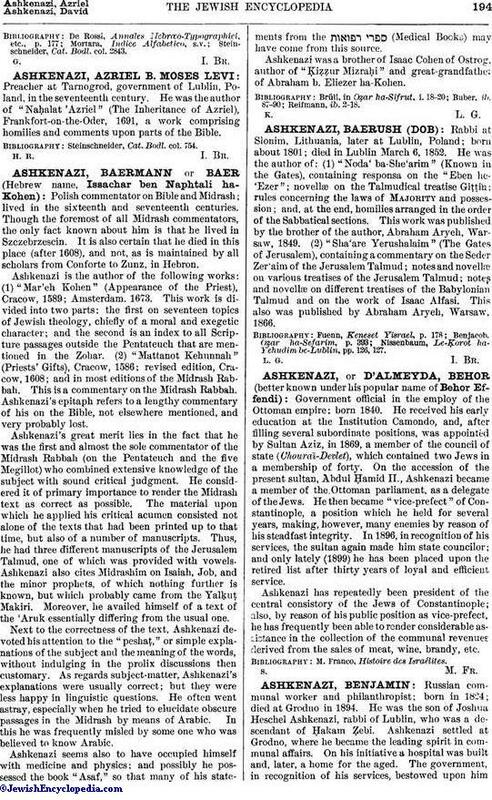 Ashkenazi has repeatedly been president of the central consistory of the Jews of Constantinople; also, by reason of his public position as vice-prefect, he has frequently been able to render considerable assistance in the collection of the communal revenues derived from the sales of meat, wine, brandy, etc. M. Franco, Histoire des Israélites.